GPS: S 25° 39' 53" E 28° 31' 0"
FOLLOW the N4 Witbank Freeway eastwards away from Pretoria. PASS the Boschkop/Donkerhoek turn-off and take the next turn-off (Exit 27) for Rayton/Cullinan/Bapsfontein. From the off-ramp TURN LEFT into the direction of Rayton on the R515. It’s about 6km to Rayton, but see that you keep to the speed limits - the traffic police often try to make money out of travellers! Continue through Rayton, pass Zonderwater Prison on your right and Afgri OTK further along on your left. Upon reaching a 4-way stop, TAKE THE SLIPWAY TO THE LEFT leading you into the R513 going westwards. PASS the Premier Golf Course in Cullinan on your right and cross the railway line. CONTINUE until you get to a T-junction andTURN RIGHT into Olienhout Road. CONTINUE on Olienhout Road and CROSS the railway line as well as a 2-way stop street. TURN RIGHT at the “De Beers Mine Parking” sign and then immediately LEFT into South Road. FOLLOW this road as it TURNS RIGHT into Hospital Road and CONTINUE past Cullinan Hospital. 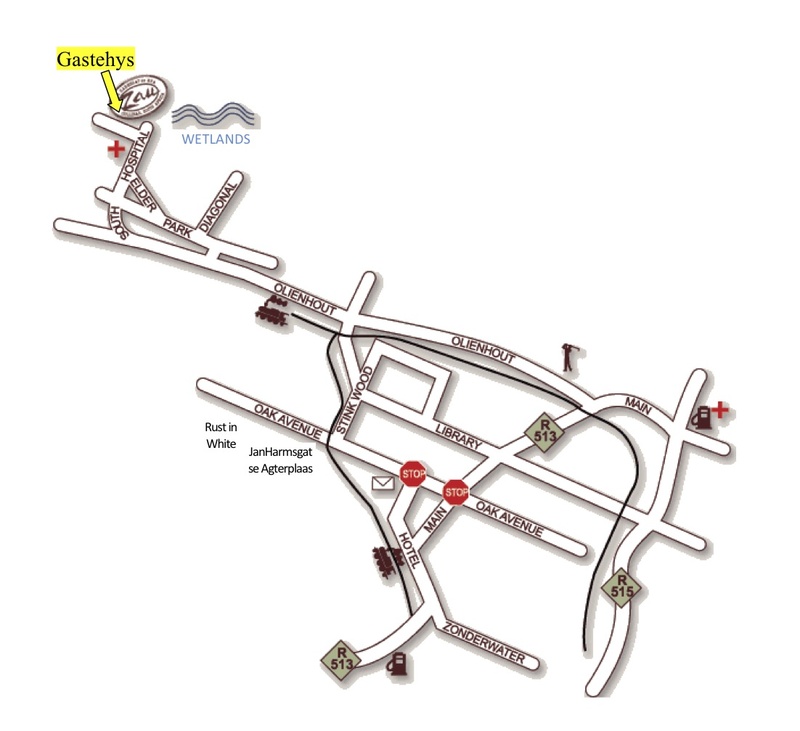 GO AROUND the traffic circle and continue straight to Gastehys JanHarmsgat at 8 Hospital Road. FOLLOW the N1 north highway towards Polokwane until you reach R513 Sefako Makgatho Drive (Old Zambezi Drive). TAKE this off-ramp and continue until the first robot. Turn RIGHT at the robot into the R513 Sefako Makgatho Drive and continue eastwards towards Cullinan, about 25km further. CONTINUE straight past the Zambezi Mall, cross the R573/M15, a set of robots as well as a 4-way stop. Driving into Cullinan you see a Caltex petrol station on your right and you cross a railway line. KEEP LEFT to drive into Hotel Street and continue about 600m until you reach a 3-way stop with the Post Office on your left. TURN LEFT at this stop into Oak Avenue and continue past Nedbank on your left, a 4-way stop and Premier dairy on your right. TURN RIGHT into Stinkwood Road at the T-junction just before a railway crossing. KEEP LEFT where the road forks and cross 2 railway lines. TURN LEFT into Olienhout Road at the next stop street. TAKE the R25 turnoff TO Bronkhorstspruit, Bapsfontein and Tembisa. At the stop, turn left towards Bronkhorstspruit and travel east along this road until you come to a T-junction with the Old Pretoria/Delmas Road. Turn right towards Delmas (it is still the R25) and pass the Flight Inn and BP Bapsfontein petrol station on your left. At the first 4-way stop street, turn left to continue on the R25 towards Bronkhorstspruit. Continue along this road past the Zesfontein turnoff, Welbekend police station, Garsfontein turnoff, Wapadrand turnoff (Conradie Organics on your left) and Klipkop AH. At the next turnoff, turn left onto the R515 towards Cullinan and Rayton. TRAVEL along this road past the Boschkop and Donkerhoek turnoffs (Rhino Park on right and Diamond Hill on right). CROSS over the N4 highway and the next 4-way stop and carry on with the R515 towards Cullinan and Rayton (about 7km). See that you keep to the speed limits - the traffic police often try to make money out of travellers!